University of Adelaide researchers have invented a world-first tiny fibre-optic probe that can simultaneously measure temperature and see deep inside the body. The probe may help researchers find better treatments to prevent drug-induced overheating of the brain, and potentially refine thermal treatment for cancers. 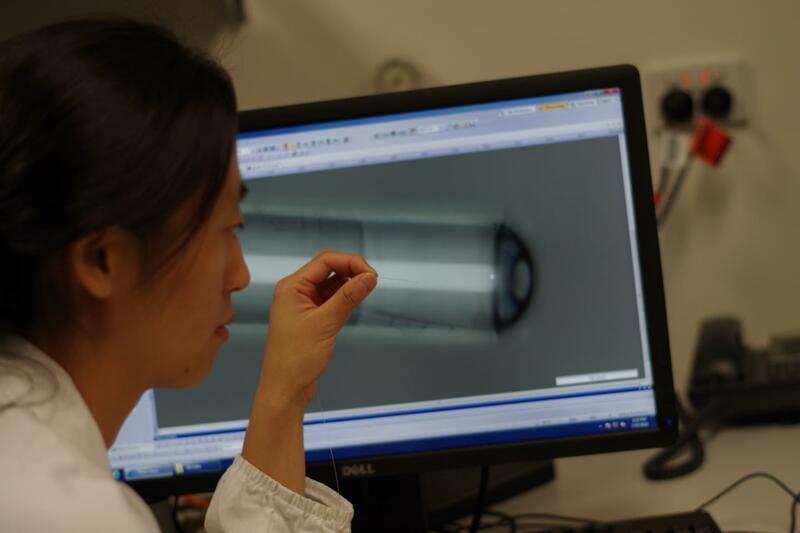 "With an outer diameter of only 130 microns, the probe is as thin as a single strand of human hair," says Dr Jiawen Li, a researcher with the Adelaide Medical School, ARC Centre of Excellence for Nanoscale Biophotonics (CNBP) and the Institute for Photonics and Advanced Sensing (IPAS) at the University of Adelaide. "This means it can be delivered deep inside the body in a minimally invasive way. It also allows us to see and record physiological data in real time that we weren't able to access before." The miniaturised imaging and sensing probe has been developed to help study drug-induced hyperthermia. "Using some drugs such as ecstasy can make certain brain regions overheat and then become damaged," Dr Li says. "Using the probe's imaging function during experiments, our medical collaborators would be able to see deep inside the brain of a living organism and guide the placement of the probe to the right brain region." "Then, they can use the probe's built-in thermometer to monitor any changes to the local temperature of that region." This will allow researchers to: better understand how hyperthermia develops; test new medical treatments; or investigate the toxicology impacts of drug-taking. The probe also has potential to provide insights into other diseases and treatments in other parts of the body, such as optimising thermal treatment of cancers. While the first generation of the probe can both take images and measure temperature, Dr Li hopes future generations will take other measurements as well – such as pH values, oxygen saturation and accumulation of fat in arteries. "This research is an example of the inspiring transdisciplinary culture nurtured at IPAS and CNBP to enable new tools not possible within a single discipline," says Professor Heike Ebendorff-Heidepriem, the Deputy Director of IPAS. "IPAS and CNBP has world-class expertise in photonics, and Adelaide has a large number of medical researchers that allows us to explore new ways to use light-based technologies," says Professor Robert McLaughlin, Chair of Biophotonics at the University of Adelaide. "It makes South Australia an exciting place to explore the overlap of technology and medicine." Dr Li's research has been published in the journal Optics Letters. Dr Li was a South Australian finalist in Fresh Science, a national program that helps early-career researchers find and share their stories of discovery.